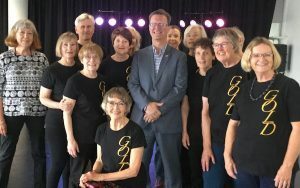 Canberra Dance Theatre is a not-for-profit member organisation run by an enthusiastic volunteer board of management with a range of skills and experience. A small part-time staff of Business Manager Neil Roach and Artistic Co-ordinator Jacqui Simmonds manage the day-to-day activities, and administration volunteers usually manage the office in the evenings. The Board is committed to the delivery of quality dance programs, community performances and classes locally, nationally and internationally. Board members are active in supporting the administration and special events. Board meetings are held every six weeks with an Annual General Meeting held once a year. Any CDT Member with appropriate skills who is interested in being part of the Board should contact the Chair to discuss this further. A guide to membership of Boards of community organisations can be found here. The Annual Report for 2016 can be found here. Want to help CDT, learn new skills, and earn free dance classes? Administrative volunteers are the people who staff the office in the evenings and weekends for classes. CDT can’t afford 24-hour staff, so the administrative volunteers make all the difference – and they are dancers themselves who love to be part of making CDT such a special place. Please contact the CDT office to see which shifts are available. As a volunteer organisation – we love volunteers!